Lifeline® Normal Human Cardiac Microvascular Endothelial Cells, when grown in Lifeline® VascuLife® VEGF-Mv Medium, provide an ideal low-serum culture model, for the study of angiogenesis, atherosclerosis, or vascular biology. Lifeline® Human Cardiac Microvascular Endothelial Cells are isolated from human heart tissue, plated onto culture vessels, and expanded in culture vessels three times before being harvested for cryopreservation. Cardiac Microvascular Endothelial Cells are cryopreserved at the earliest possible passage to ensure the highest viability, purity, and plating efficiency. 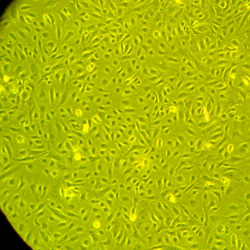 Our Cardiac Microvascular Endothelial Cells are quality tested to ensure optimal growth and morphology over a period of at least 15 population doublings. Lifeline® Human Microvascular Endothelial Cells are not exposed to antimicrobials or phenol red when cultured in VascuLife® Media. Lifeline offers antimicrobials and phenol red, but they are not required for eukaryotic cell proliferation. A vial of Gentamicin and Amphotericin B (GA; LS-1104) is provided with the purchase of VascuLife® VEGF-Mv (LL-0005) Medium Complete Kit for your convenience. The use of GA is recommended to inhibit potential fungal or bacterial contamination of eukaryotic cell cultures. Phenol Red (LS-1009) may be purchased, but is not required.